How do you get a country excited about tourism? 1. Tourism is super important, accounting for 10 per cent of Australia’s export earnings. 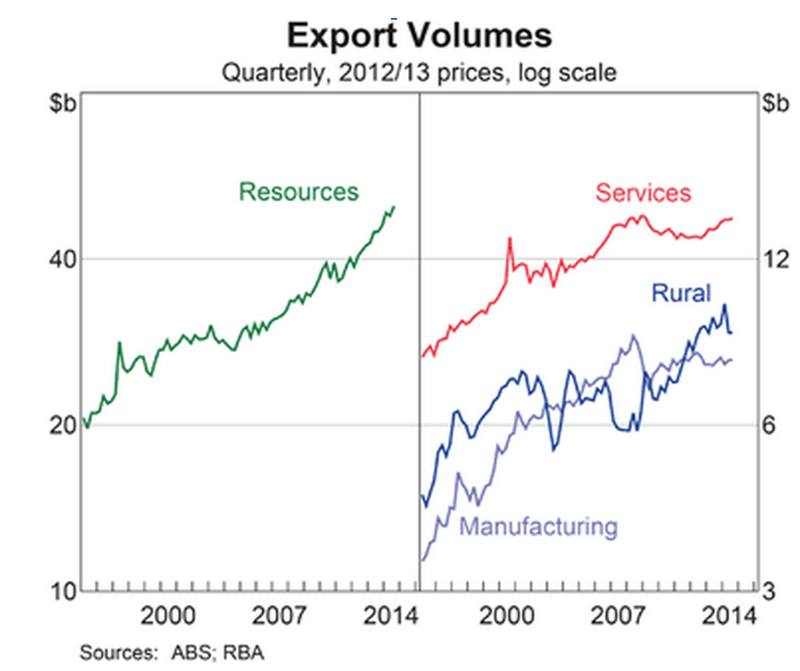 Services are our second biggest export sector and tourism is Australia’s largest services export. 2. Tourism’s moment has come. 3. International tourism is understood to have public good aspects (e.g. brand Australia) that warrant some public spending on attracting visitors. Tourism is also a public policy issue because regulations around immigration and customs, aviation and airports can determine the cost effectiveness of a trip to Australia. But at this crucial moment for the industry, government funding for Tourism Australia has gone from $132 million in 2012 to $129 million in 2014. That’s a fall from $21.29 per visitor to $19.64. 4. The Government does not have a minister holding the title of Minister for Tourism (they do have a Minister for Sport). The Trade minister has tourism in his portfolio. But he has been accused of “neglect” for the sector. 5. There have been no data released on overseas arrivals since September 2014. The Department of Border Protection changed the arrival cards and completely screwed up the system that had delivered excellent monthly data for the previous 14 years. The timing of this mistake, at a likely inflection point in inbound tourism, is truly remarkable. 6. To make matters worse, right now the Productivity Commission is trying to put together a major report on tourism, in the absence of that data. I have written before about the best way to invest to take advantage of the coming tourism boom, with AirBnB seeming like the safest bet. But as well as dispersed individual actions, we need a big coordinated push, and that doesn’t look like happening yet. Services industries remain a side-show to the “real” economy of tangible things in too many people’s minds. Can the PC report shock the government into doing more? Or will the government remain focused on issues like foreign purchase of agricultural land? Posted on February 20, 2015 February 20, 2015 Author thomasthethinkengineCategories UncategorizedTags Australia, Economics, tourism2 Comments on How do you get a country excited about tourism? Why abandoning the census could be a good idea. Sample size requirements are totally counter intuitive. I remember my statistics professor mathematically demonstrating to us the relationship between sample size and population size. Our minds were boggled. For your personal enbogglement, I’ve charted that relationship here. It shows the sample size needed to get a 1 per cent confidence interval with a 99 per cent confidence. The salient point is the flattening out at the top. Please note the compressed nature of the horizontal axis. Data source: Research Advisors. 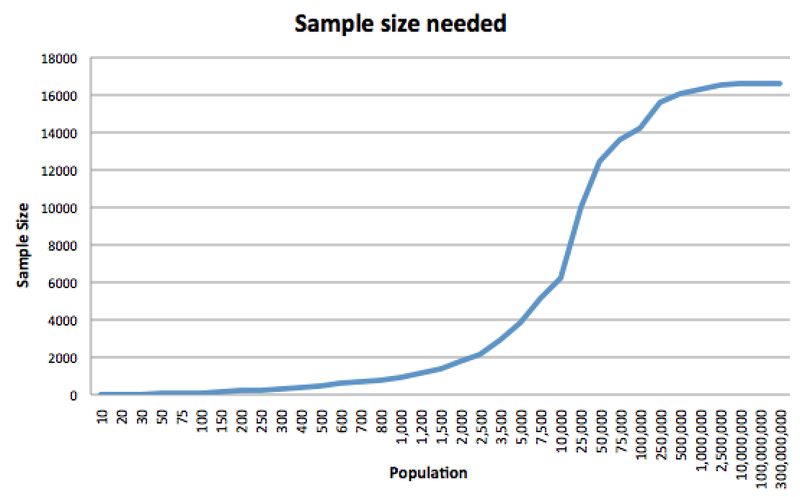 It is intuitive that if you’re enquiring about a big population, you need a big sample. Intuitive, but wrong. Once you’re surveying a population of more than 500,000, there’s scarcely any need to increase your sample size. Sampling more than 16,000 people out of a large population means adding very little value. This is good news. It means our society’s reliance on survey data – for everything from who should be PM to how peanut butter should taste – is efficient. 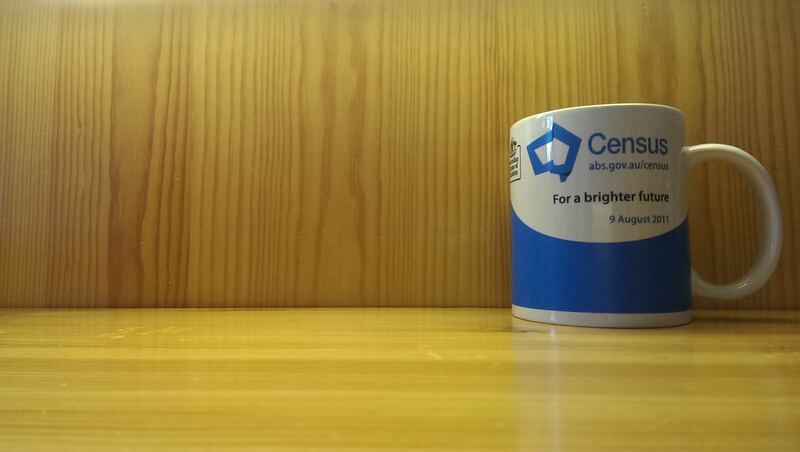 So why do we run censuses? Partly because the Census Act 1905 compels us to, every five years. Partly because we always have, and partly because the UN encourages us to. The census offers value, no doubt. I use the data often. It makes sure no community is left out. You can use the census portal to dive down into detail on where you live and get accurate data. But does the census get localised data effectively? If you’re interested in small, remote, unusual communities that you will never otherwise survey, do you really want to ask them the same few questions that are appropriate for everyone else? Or is that a missed opportunity? Instead of the census, we could ask small communities specific and relevant questions. In remote aboriginal communities, it might not make sense to ask people about their journey to work, but it might make more sense to ask for example about what they eat, which the census does not do. I love the ABS, and I cherish this mug I got on the day of the release of the 2011 census. The census costs a lot – reportedly $440 million last time – with the price tag going up for the 2016 iteration. The entirety of the ABS Budget is just $400 million, with which they put out new data and analysis just about every day. I do not – DO NOT – support cutting the budget of the ABS to do their important day to day work. But I can see why running a census every five years might seem like a waste of resources that would be better used supporting that work. The best reason to axe the census would be that it adds little empirical exactitude when obtaining estimates of the great homogenous mass of us, and is too blunt to ask the questions that matter of the smaller communities it covers. Anyone who has read this far may be interested in my review of the US census, which I was lucky enough to participate in during 2010: The US census incensed us. I sense a lack of consensus. Posted on February 19, 2015 February 19, 2015 Author thomasthethinkengineCategories UncategorizedTags census, statistics4 Comments on Why abandoning the census could be a good idea. Economists are now predicting the rise of the robots will impoverish us. Can that be true? I’ve just read a frightening new working paper by authors including Jeffrey Sachs, outlining scenarios under which the rise of robot competition could actually make people worse off. The paper acknowledges that such predictions have been made before, and proved wrong. There were some details in the history of Ludditism that I didn’t know, particularly the role of the state in defending novel production methods. The team runs the models several times and gets a range of different answers depending on assumptions. But the news is certainly not all good. The model has ‘retention of code’ as a central feature. They argue that over time, useful code builds up so that new code is less and less necessary, leaving less and less work for people engaged in its production. It assumes over time code becomes more durable, driving unwanted “high tech workers” to go and work in the services space, where they drive down wages. The ‘retention of code’ is a key feature of the model. When the researchers ramp up the coefficient on that, the model has gloomier and gloomier predictions. But is code different to any stock of knowledge? Humans have invented designs for thousands of perfectly functional cars, yet there’s work being done on inventing new and better ones at a fantastic rate. Computer code may accumulate, but “rules and instructions for generating output from capital” sounds like management. I don’t see managers being replaced by computers soon. The model also has no room in it for the rapid expansion of the service sector. I’ve written about this before, and I think it is a central to an economy operated by the fanciful and idiosyncratic species we call humans. If our needs are met cheaply, we will invent new things to want. Nevertheless, the paper adds to the rich debate over what might happen in an economy where humans are not directly engaged in the tasks most important for their survival. Posted on February 18, 2015 February 18, 2015 Author thomasthethinkengineCategories UncategorizedTags Economics, robotsLeave a comment on Economists are now predicting the rise of the robots will impoverish us. Can that be true? How likely is the bond market to crash and ruins us all? When countries go into debt, they don’ reach for the credit card. They reach for bonds. By selling bonds, a country gets a stack of cash it can spend, and all it has to do is pay back those bonds in the future. A lot of countries have a lot of debt, the global bond market is active. People don’t just hang onto the bonds they bought from governments. They’re traded. The price of the bit of paper goes up and down even though the amount it entitles you to stays the same. Some people find bonds to be a very good investment and they are also closely watched as markers of trouble. When it looked like Greece was going to be kicked out of the eurozone, its bond yields shot through the roof. (Bond yields are the inverse of the market price. If you pay $1000 for the bond described above, your yield is zero (assuming inflation of 3 per cent).) In 2011, everyone was selling Greek bonds and buyers were few. Those high yields said nobody wanted to buy Greek bonds. Or Portuguese, or Italian. Bonds work a bit like a stock. There’s always something to worry about. When yields are up and price is down, it’s because people think that entity is going to go broke. When yields are down and prices are up, people start to worry that the price has overshot and might suffer a damaging correction. Overall, riskier countries have lower bond prices and higher yields. For example, Japan’s bonds cost a lot, and yield just 0.4 per cent, because that nation is believed to be trustworthy and reputable. But suddenly, the whole bond market is looking more Japanese, and that should rouse suspicion. Bonds are a hot topic because of plunging yields in the last few years. Does anybody really believe all the risk has gone out of these countries? Does it really make sense that Spain can borrow money at under 2 per cent? I think I’m less of a credit risk than Spain (unemployment 24 per cent) and my credit card company charges 10.99%. What we may be looking at here is a bubble. All these bonds are in hot demand. But what happens if the bubble pops? The people that hold them lose money. That includes central banks, hedge funds, private investors, superannuation funds and banks. Any of whom could upset financial stability. The reason this topic is hot is that a sharp object has come over the horizon that could burst the bubble. A rise in US official interest rates. It seems likely that the US will start raising interest rates in the next few months, given their strong recent economic performance. (This is the view of the RBA Governor, at least). If outlooks for the US economy and global economy are better, a rate rise could coincide with investors deciding they’ve had enough of boring safe bonds, and getting back into stocks. That would see bonds being sold off. The Governor of the Reserve Bank is expecting such an event, he has just revealed in testimony this morning to the House of Representative Economics Committee. The size of the global bond market is big enough that a sharp crash would hurt the financial system. And we’ve all learned that crashes in the financial system hurt the real economy soon enough. Posted on February 13, 2015 February 13, 2015 Author thomasthethinkengineCategories UncategorizedTags bonds, Economics1 Comment on How likely is the bond market to crash and ruins us all? What sport is most space efficient? I was reading in Bloomberg about the closure of a whole lot of Golf Courses in America. They’d been built not so much for playing golf on, and more as amenity to drive up the price of surrounding homes. But it made me think about the efficiency of golf as a sport. It’s not easy to understand how golf courses make money in cities. Golf seems extremely land-intensive. I wondered how it compared to other sports. Golf is by far the worst of the lot. I calculated this by assuming four players per hole on an 18 hole course, and applying US golf association rules on the recommended minimum area for a golf course, of 60 hectares. The question of the land-intensity of sports is – perhaps surprisingly – something I have thought about often. But never before had I bothered to graph it. 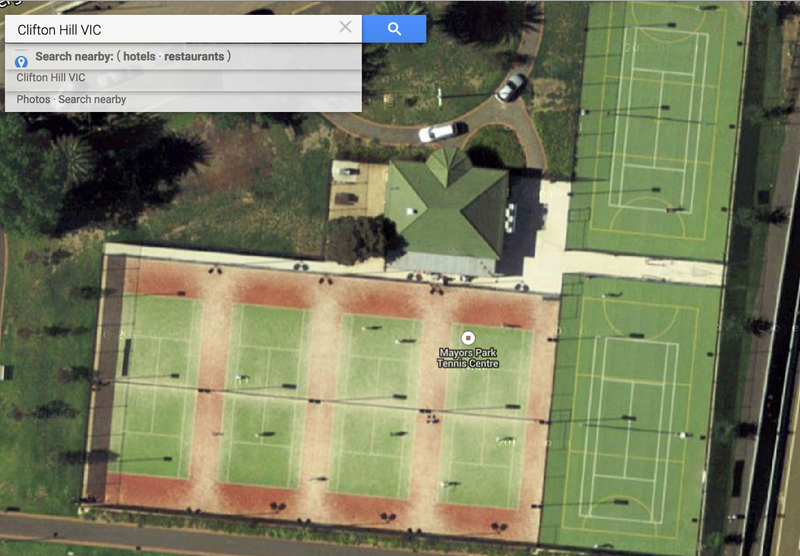 The reason I’ve pondered it is because of some tennis courts near my house that are used as netball courts on weeknights. As tennis courts, they are lightly used, but when it’s netball night they are brimming with noise and excitement and there are cars parked for miles around. Even though the courts are used for netball only a few hours a week, these courts probably mean netball to more people than tennis. The land intensity of sports is a pretty important question for governments trying to make participation in sports accessible, cheap and convenient as the density of our cities rises. When you have to rent space to play on, it makes sense for that space to be minimal. The most land efficient sport in which you would plausibly break a sweat (or break an ankle) is squash. Squash I seem to remember being popular in the 1980s. My dad used to play when he was a lot younger. I’m not sure why it fell from favour, but perhaps Donald Rumsfeld’s enthusiasm for it has something to do with it. Anyway, on a squash court, two adults can do serious work on their heart health in just 62 square metres, making it a sport that is ripe for a comeback in the ever more crowded 21st century. (nb. this doesn’t calculate three dimensional area, and squash courts are tall). Cricket, meanwhile, comes out of this looking rather bad. My calculations use 17,000 square metres as the size of the field, which is the approximate area of the SCG. Leaving half the players on the sideline is what really ruins cricket’s numbers, because at any time there are only 13 players actually playing. It’s almost as bad as golf. AFL, which uses the exact same fields as cricket, manages to put almost 3 times as many bodies into the same space. Posted on February 12, 2015 February 12, 2015 Author thomasthethinkengineCategories UncategorizedTags land use, sport8 Comments on What sport is most space efficient? What Mr Hockey will do next. Last night on ABC’s 730 program, the Australian Treasurer demonstrated that he has a lot of changing still to do. But the loudest message was that he had not fully understood the events of recent weeks. He appears to think that the Government’s problems are all about Tony Abbott, because he insisted that all he needed to do was better explain his policy choices to the electorate. Of the two – Abbott and Hockey – it is Abbott who got closest to the fire and Abbott who has learned the most. Abbott has spoken about listening more, to both the public and the party room. Mr Hockey may think that is yet more spin. But I doubt it is. The 2015 Budget is going to be designed with a lot less guidance from Hayek and a lot more from Roy Morgan. The problem is that Joe Hockey doesn’t realise that yet. So Mr Hockey is going to have to adapt. Adapt or perish. If and when he adapts, in some small part of his being he may wish he’d been rolled as Treasurer on Monday. But in his 730 Report interview he said several times “the customer is always right.” Let’s generously assume that motto means he can and will adapt. So what will he do in this new, constrained environment where ideology is out and the Budget is worse than it has been for a long time? The new, chastened, post-realisation Mr Hockey will be faced with a set of unenviable choices. He can let the deficit blow out, he can cut spending, or he can raise more revenue. The most unenviable part of his dilemma is that he will probably have to do all three. Suffer the ignominy of a great big budget deficit, trample all over his own principles by raising taxes, and risk the wrath of the electorate by making more cuts. Mr Hockey’s task in the next few months is to make this something other than a political suicide note. After surprising the hell out of the electorate with his first budget, he won’t be allowed make the same mistake again. You can be pretty sure that the key ideas in the document to be released on the second Tuesday in May will have been given a thorough airing. Cuts will be thin on the ground. Reinforcing the message that the Coalition slashes and burns will not be welcome in the party room. That leaves a gaping hole of a deficit. As you can see, the numbers involved are real. Many many billions. GST and the family home are probably no go areas. But some of these tax expenditures – on superannuation and capital gains – overwhelmingly help the Coalition’s older, richer, higher marginal tax rate base. Politically, removing or changing them may be the best option, because the Government has lost the centre, and needs to regain it. Tax hikes that hurt working families will be off the agenda in 2015. This will go against almost everything Joe Hockey believes in, except his belief that his government should win the next election. But as I wrote last year, Joe Hockey is likely to resolve his cognitive dissonance in favour of an election-winning strategy. There’s always another choice. Posted on February 11, 2015 February 11, 2015 Author thomasthethinkengineCategories UncategorizedTags Australia, budget, Economics, joe hockeyLeave a comment on What Mr Hockey will do next. Today data came out showing Australia’s house prices rocketing up. The average price for a home in this country is now $571,500. We hear a lot about the homes at the top end of the distribution, places that cost 100 times as much as the mean, like this Mosman Park pile for $57.5 million. We don’t hear so much about the other end. There must be houses in this country that cost a lot less than the mean. I went looking for them. This place in outback NSW costs $40,000. You could imagine living there, stepping out onto the verandah with a cup of Bushell’s tea as the sun rises through the eucalypts, thinking: I made a good choice. This place 200km away costs $39,000 and I thought you couldn’t go much lower. Not pretty, but (presumably) effective. Three bedrooms, one bathroom. Large block. 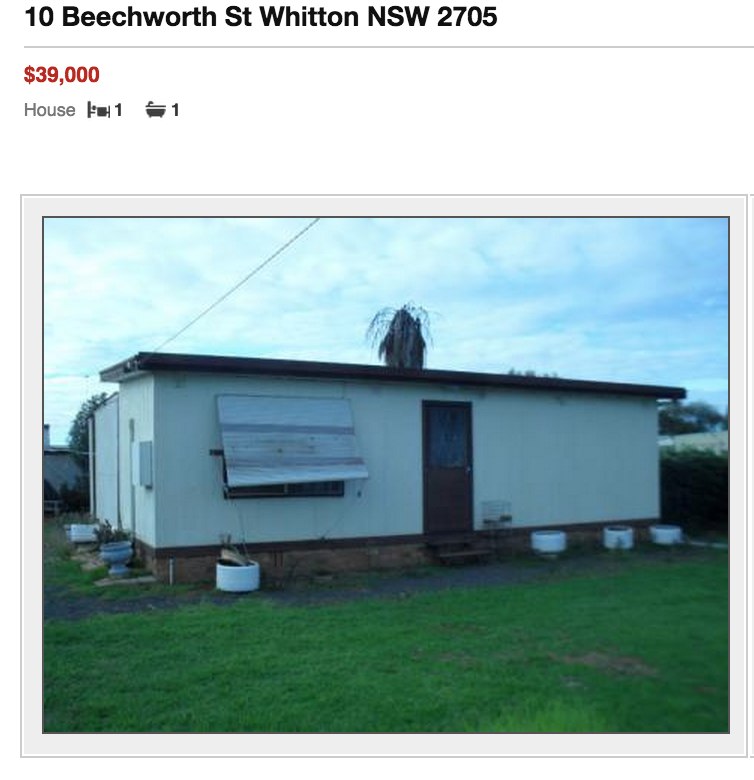 The lack of interior shots in the listing should rouse suspicions, but if you’re game to renovate this place, it’s near to a supermarket, a hospital and a park. Cunnamulla has a river, and a train station with services twice a week. It’s also host to the Cunaumulla Fella Festival, an annual celebration of rodeo riding, etc. 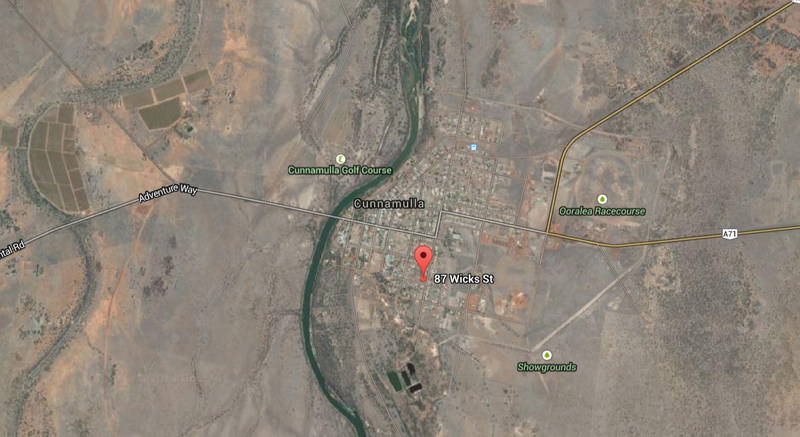 The closest town you may have heard of is Bourke, about 250km away. Paying $13,000 for a whole house seems incredible. In Melbourne, that would buy you 2 per cent of the median home, five nights accommodation in certain fancy hotel suites, or a sedan with 156,000 km on the clock. But here’s where this story goes from being a fun way to think about our crazy housing market to a rather more serious reflection on race and poverty. The most recent news article about Cunnamulla is about a teenage mum who got her scuba license by practising in the river and wants to leave to work on the Barrier Reef. The official unemployment rate is 5.9 per cent, but the region’s population of 1900 supports only 892 jobs, suggesting labour force participation is low. 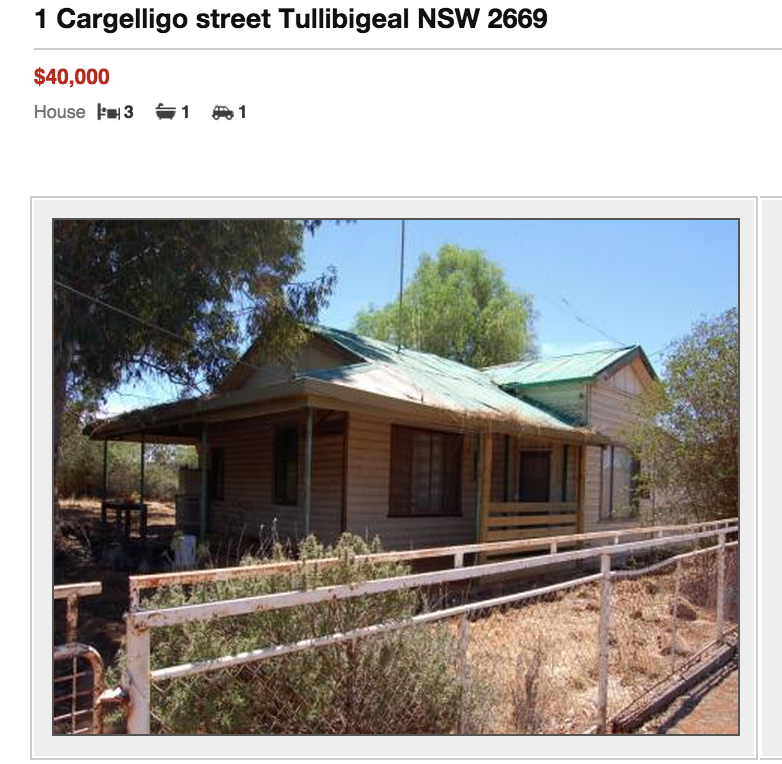 In short, there’s a reason houses in Cunnamulla – even ones in decent condition – sell for so little. And those reasons are not nice. This is a country of extremes – not just of drought and flooding rains, but of wealth and poverty. It’s easy sometimes to forget about the poverty. I’m somewhat ashamed to have started writing this post thinking only of the amusement value of a cheap house, and not at all about the conditions that explain it. Posted on February 10, 2015 February 10, 2015 Author thomasthethinkengineCategories UncategorizedTags Australia, Economics, real estateLeave a comment on Australia’s cheapest house.